We were still living in the United States when we had our first experience transferring funds across international borders. We had to cover the fees and deposits for the flat we rented in Valencia. Until then our simple banking needs were handled by our credit union. But, the tellers at our local branch had never made an international wire transfer. That first transfer took a couple of hours of face-to-face effort. It took me a couple of months and a few mistakes to figure things out, but today our banking is no more difficult than paying our monthly bills in the U.S. used to be. Disclaimer: If GentleCycle.net had a team of lawyers, I am sure there would be pages of disclaimers here, but we don’t. So please remember, this is just an account of my personal decisions, I am not advising, recommending or attempting to influence your financial decisions. Maybe you can avoid some of my missteps. It’s probably happened to you too. Years ago Susan and I were off on a vacation trip in the U.S. when the credit union stopped both our credit and debit cards. A couple of phone calls was all it took to find a solution. That experience clarified for me the need to have a backup plan. Besides, it reminded me I need to notify the credit union whenever I am traveling away from my home turf. Even though I prefer simple solutions (to just about everything), I thought it would be much harder to resolve account issues quickly from Europe and decided to open a backup bank account. And in less than two months my notion that I needed a backup was justified as I struggled to resolve a host of banking issues. Unfortunately, they arose from my so-called backup account. Charles Schwab offers a High Yield Investor Checking Account and many Americans living overseas recommend the account because of the worldwide, unlimited ATM fee rebates. They also require clients to open a brokerage account. So Susan and I spent some time with a Charles Schwab advisor explaining our plan to live in Spain and discussing our investment needs. Based on her recommendations, we opened one of those Charles Schwab bank accounts and even invested a significant portion of our nonretirement savings via the associated brokerage account. I thought about closing the credit union account when we departed Oregon, but then I thought about free checking, the low cost overdraft safeguards, and the Visa credit card with unusually friendly foreign exchange rates and decided, no, maybe not just yet. That was a good call. Six weeks later, having just moved to Spain, I received a series of notices that the Charles Schwab accounts we’d opened because we were moving to Spain are not available to “foreign investors” which they define as anyone who is a resident of a non U.S. country. Charles Schwab gave me 30 days notice before they unilaterally closed our accounts. So that didn’t work. Adjusting and adapting to living in a different culture isn’t easy and I sure didn’t need the added stress the Schwabies loaded on me. Fortunately, my good old fashioned credit union accounts were still there. Today they remain our primary U.S. checking and savings accounts where I keep a small cash reserve and from which I pay our occasional U.S. bills. Susan and I together have two debit cards and two credit cards. The debit cards are for our credit union and Spanish checking accounts and the credit union Visa credit card is our backup credit card. 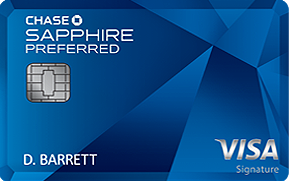 For our primary credit card I selected a Chase Sapphire Preferred Rewards card. We pay off our card balances monthly so the card’s high interest rate didn’t affect my decision. 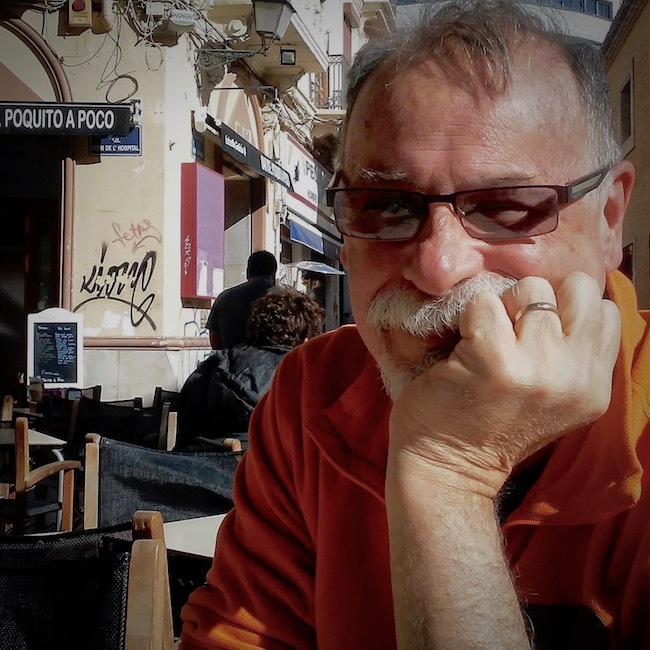 The rewards program saved us several thousand dollars on our flights to Spain, and I’ve never had a problem using the card in Europe. Like almost everyone these days we had several IRAs, Roth IRAs, and 401(k) retirement accounts. Before we moved to Spain we managed to transfer, rollover, and consolidate everything at one of the big, but not Charles Schwab, mutual fund companies. I find it much easier to understand our financial position when I can look at the different retirement and after-tax investment accounts together. I was sure to link my credit union account to the mutual fund company account and set up an automatic monthly transfer from our retirement savings to the credit union. Well, now that we are actually retired I guess it’s a retirement spending account. We needed to open an account with a Spanish bank. Mobile phone/internet accounts and utilities like natural gas, water, and electricity all require a local bank account. Possibly even your rent will be debited on your local account. Everyday expenses like groceries are most easily managed (I think) with a local account. Many people worry about opening a Spanish bank account but you probably shouldn’t. You can open an account at most banks with a passport, but we just registered for the padrón and opened a resident account with Deutsche Bank ES the second week we were in Spain. The resident account is quite flexible and is free with a €600 euro monthly deposit. Besides that, the online banking website has an English language option and we haven’t had trouble locating Deutsche Bank ATMs. Different people have much different experience with the various banks. We are happy with Deutsche Bank ES. Others hate it. I think the real difference is how the customer service staff treat you when you open the account. I can’t exaggerate how stressful the first few days trying to settle in can be. But when we opened our Spanish current account, our personal banker, Amparo, was understanding and patient. It was one of the few sweet and easy tasks we faced during our first few weeks in Spain. A word of caution: As Americans we are required to file a Report of Foreign Bank and Financial Accounts if we have a financial interest in, or signature authority over at least one financial account located outside of the United States; and the aggregate value of all foreign financial accounts exceeds $10,000 at any time during the calendar year. Each month I transfer funds more or less equal to our monthly budget from the U.S. to Spain. I tried several different options: wire transfers through my credit union, Xoom, the PayPal platform and I finally settled on TransferWise. My TransferWise account is a borderless account. I have two active currencies: U.S. dollars and Euros. The dollar account has its own routing number and the euro account its own IBAN number so I can send, receive, and hold money in either currency. I transfer dollars from our credit union to our TransferWise dollar account when the exchange rate seems favorable. I convert those dollars to euros which are deposited into our TransferWise euro account. Transfers from our credit union to my TransferWise dollar account usually occur within 24 hours, except on weekends. The transfers from the euro account to our Spanish bank account resolve in a matter of a few hours. I consider the international account as that backup bank account I mentioned earlier. A word of caution: The initial deposits took much longer, more than three days for the identity and account confirmation process. 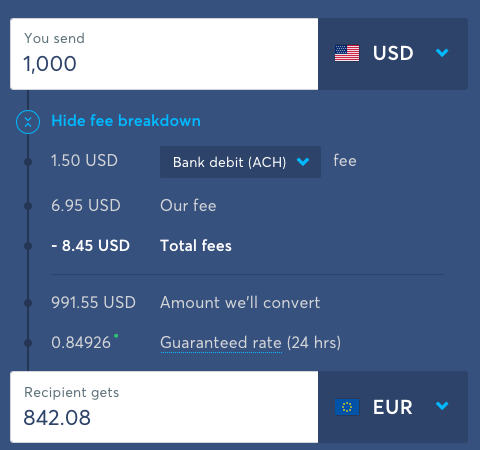 Each month I usually end up incurring $9.05 in transfer fees, $1.50 for the credit union debit, which would be free with a wire transfer, the $6.95 TransferWise fee and an additional $0.60 for the transfer from our TransferWise euro account to Deutsche Bank. There are many companies that don’t charge any transfer fee, so why would I willingly pay TransferWise? The simple answer is that they always have the best exchange rate and that more than makes up for the fee. TransferWise uses the mid-market rate, independently provided by Reuters without any markup. The exchange rate is guaranteed as long as TransferWise receives your money within 24 hours. A word of caution: I check the USD/EURO exchange rate regularly and mentally adjust our budget accordingly. We started our planning when the dollar was at 1.06 euros and over the past few months tightened our belts as the euro climbed to 1.24. That’s like the 18 percent inflation we remember from the late 1970s. We’ve had to think through our investment strategy to accommodate the foreign exchange rate risk. So, like I said at the opening, I spend slightly more time moving and tracking our money now that we live in Spain. With our consolidated retirement account, that old standby credit union account, TransferWise, and DeutscheBank ES I have several more moving parts to consider, but I really only need to pay close attention to bill paying for about 20 minutes a month. Our biggest challenges were recovering from the shock Charles Schwab delivered when we were fresh to Spain and sorting through the money transfer options. I hope you find this post useful. Let me know your thoughts and experiences. Banking is actually fairly easy with a good internet connection. Taxes, are harder to understand. Let us know how the visa process unfolds. Still working on those Spanish visas. I read so much conflicting information about taxes in Spain. What has your experience been in Valencia? Spanish taxes seem to confuse everyone. Susan and I haven’t yet had to file income tax because we were not tax residents of Spain in 2017. So I have no first hand information. I recently read this blog post A How to Guide On Filing Spanish Income Taxes from SpainGuru. It might be helpful. And Spain Citizens Advice Bureau has always been a reliable source of information for us. Our friends from the UK just finished their filing and were surprised to end up in the 30 percent tax bracket. The lowest bracket is 19 percent. YIKES! Sorry I can’t be more helpful. We will know more in the next several months. No need to reply to my previous comment. 🙂 We figured out a solution. This is an incredibly helpful post. We are going through the process of consolidating accounts. We would love to know which companies you researched as viable possibilities for investment accounts. We have not had positive experiences with Schwab either, and it was helpful to read about your negative experience with them. They are definitely not an option. Thank you for your help and for taking the time to write such thorough posts. Excellent information, thank you. Through your hard work, my life has, again, been made easier.